Mix together all the ingredients (except fruit salt) for idli in a bowl to make a thick batter. Add more water if required. Let the batter stand for at least half hour. Grease the cups of an idli maker. Just before making the idlis, add fruit salt and mix it in well. Pour the batter into prepared idli maker and steam in a microwave for 4-5 minutes or steam on gas for 10-12 minutes. Keep aside. Add asafoetida and mustard seeds. When the seeds crackle, add the curry leaves, green chillies and ginger. Sauté for a minute. Add chopped onions. Sauté for 4-5 minutes and then add the chopped tomatoes. Mix well and sauté for a couple of minutes. 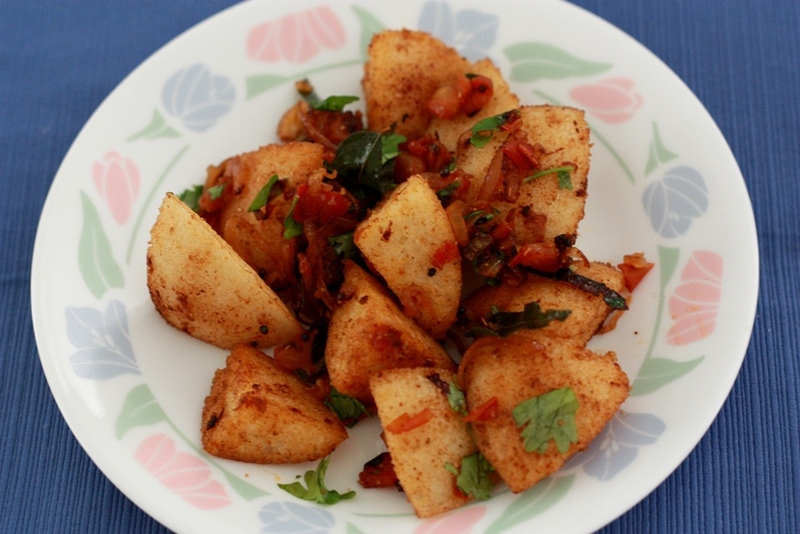 Cut the idlis into quarters and add it to the pan. Toss the idlis so that they are well coated in the mixture. Remove from heat; mix in chopped coriander and serve hot. Khaki khali picture dekhte hain. Rating dene ka mauka kab milega? Wow I tried it …..